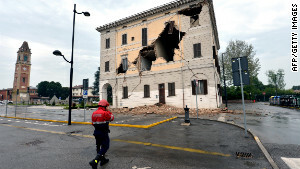 A rescuer walks near the town hall in Sant’Agostino village after a powerful earthquake shook Italy’s industrial and densely populated Northeast early on Sunday, May 20. Finale Emilia, Italy (CNN) — Northern Italy was shaken by an aftershock Monday morning, a day after a magnitude-6.0 quake killed at least seven people and left thousands of survivors huddling in tents or cars overnight. 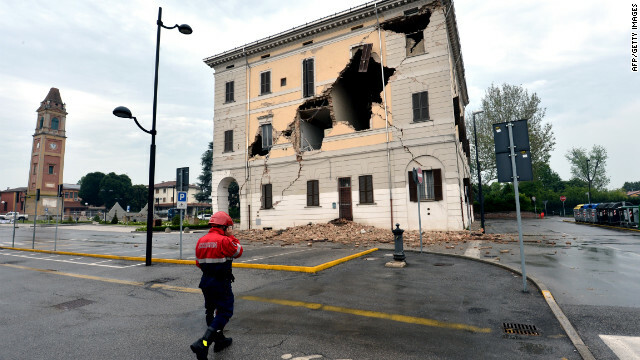 Monday morning’s aftershock caused buildings to sway in the town of Finale Emilia, in Italy’s industrial heartland. The tremor had a magnitude of 3.2 and hit near the site of the original quake, according to the Italian Seismic Service. The head of Italy’s Civil Protection Department, Franco Gabrielli, said 11,000 people had been displaced by the first quake around 4 a.m. (10 p.m. Saturday ET) on Sunday morning. The government put 3,000 people up in tents or hotels, but could not shelter everyone who was displaced. 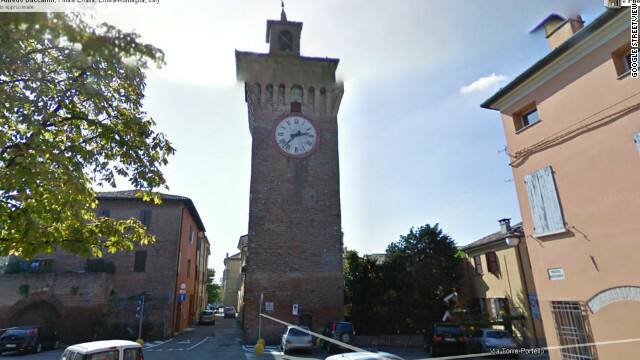 In Finale Emilia, about 35 kilometers (21 miles) north of Bologna, 75 people were sleeping in cars in a public park. One of them was Filomenna Gatti, who planned to cram into a Fiat Punto with her husband and three children under 6. Italian Prime Minister Mario Monti was expected to return from the NATO summit in Chicago on Monday. Monti said Sunday he was leaving the conference early, vowing, “All that is necessary will be done as soon as possible” to help the survivors. 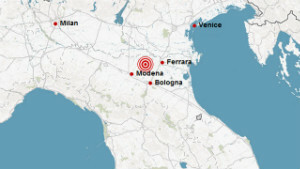 The quake was centered about 4 kilometers outside Camposanto, northwest of Bologna, the U.S. Geological Survey reported. In addition to the seven reported fatalities, 50 people were injured in the quake, Gabrielli said. The stricken region is part of Italy’s industrial heartland, and the dead included two people killed in a ceramics factory in Sant’Agostino di Ferrara, about 30 kilometers from the epicenter, civil protection agency spokeswoman Elisabetta Maffani said. Workers were still digging through rubble in hopes of finding survivors in Sant’Agostino, where the quake knocked down a church bell and a magnitude-4.8 aftershock brought down part of its city hall Sunday evening. The civil protection agency said it expects to get more reports of injuries as rescue workers make their way to remote villages in the mountainous area. Heavy rain was expected to continue into Tuesday after hampering rescue efforts and efforts to spot survivors from the air. Other deaths included one person killed when a work shed collapsed in nearby Ponte Rodoni di Bondeno, Maffani said. In addition, a woman in Bologna died of a heart attack during an evacuation, a Moroccan national died when the factory he was working in collapsed and a sixth victim was found dead under rubble in Sant’Agostino, she said. The body of a seventh victim was located under a collapsed house, according to Alessio Bellodi of the civil protection branch in Bologna. The same area was struck by a 5.3-magnitude quake in January. And a 6.3-magnitude earthquake struck near the central Italian city of L’Aquila, more than 400 km to the south, in 2009, killing more than 300 and causing widespread destruction.